Click here to highlight the essentials! In case you change your mind after that, you can erase the highlighting by clicking here again. (1) What is the difference between "Swahili" and "Kiswahili?" Mozambique. and the people who speak the language. (2) Where is Swahili spoken? Victoria, Nyasa and Albert boasting more than 140 million speakers! (3) How old is Swahili and where did it originate from? Swahili had its origin at the East African coastHence the name "Swahili"The term "Swahili"
and means "coast". where it was used as a lingua franca and trade language, starting from the 7th and 8th centuries A.D. At that time the local people were involved in brisk trade — especially with Arabs etc. But they did not have a common language among them and there were no major or dominant ethnic groups whose language could be adopted. Thus everybody spoke their own language in order to interact with others and as a result, a linguistic mixture came into being. So nobody can claim that Swahili is their mother tongue, even though these days there are many East Africans who speak only Swahili as their mother tongue due to intermarriages among the different ethnic groups. The small Kenyan coastal town of Lamu is generally regarded as the cradle of Kiswahili. (4) What kind of language is Kiswahili? Gabon and Congo-Brazzaville. as well as southern Africa (except Namibia). The lexis and the grammar are based upon these languages. However, a lot of words have been adapted especially from Arabic and English. Others originated from Portuguese, German, Hindi, Persian etc. As is the case with all Bantu languages, a lot of specific vocabulary in the fields of science, technology, politics, psychology etc does not have vernacular equivalents. But because Kiswahili is also used as a medium of instruction in many Tanzanian schools, there was a need for such vocabulary to be formulated. Thus the Institute of Swahili Research (known by its Swahili acronym as TUKI) at the University of Dar-es-Salaam, and the National Swahili Council (known as BAKITA by its Swahili abbreviation) were launched in Tanzania. The former is involved in neologism (i.e. coining new vocabulary) and the latter in standardizing it for the general public. Later on, TUKI was superseded by TATAKI, the Institute of Kiswahili Studies. There are various sources of neologisms (i.e. new words). To start with, TATAKI checks whether a missing Swahili word does have a semantic equivalent in any of the vernacular languages. If not then the Institute adopts and then adapts an English (or sometimes Arabic or Latin) term. However, artificial words which do not originate from any other language are occasionally coined. This makes Swahili the most dynamic African language which is evolving constantly to cater for the needs of a changing world. So it is quite a challenge even for native speakers to keep abreast of all the new developments! (5) Are there any regional differences in Swahili? Due to the fact that Swahili covers an extensive geographic area, regional differences and dialects did arise and the most wide-spread regional variants are those spoken in East and Central Africa. The differences include accent, vocabulary, spelling and grammar. 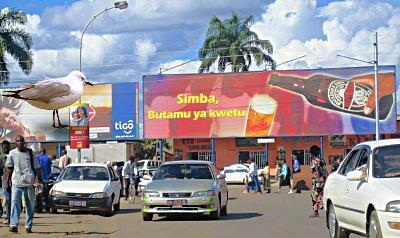 The billboard says: "Lion (brand), our local tasty beer." In East Africa, they would say: "Simba, utamu wa kwetu"
The Kiswahili spoken in Dar-es-Salaam, Tanzania is regarded as the standard version ("Kiswahili sanifu"). In addition, Tanzanian Swahili is also by far the most complicated. Many Tanzanian tabloids have a habit of using numerous, unofficial or complicated words (locally known as "bombs") which are incomprehensible even to a number of Tanzanians (especially those living abroad)! It is not worth learning such words as they keep changing every two to three months! Thus, anyone who uses the so-called "bombs" is generally regarded as being superior to those who do not understand them! (6) What is the difference between "Sheng" and "Swanglish"? Basically, "Sheng" is a new colloquial Swahili variation spoken mostly by young people in Nairobi. It is admixed with a concoction of Swahili, English and vernacular languages in Kenya. However, the grammar used is mostly as in Swahili. Only some words (mostly nouns and verbs) have been adopted from other languages and adapted to Swahili (regarding spelling and pronunciation). Moreover, the noun class agreements are totally mixed up. But any Swahili speaker would understand most of what is being said. "Swanglish" on the other hand, is just Swahili mixed with chunks of unadapted English. Many East African musicians sing in "Swanglish"
Thus it would be fair to say that colloquial Swahili spoken in Dar-es-Salaam on the one hand, and Sheng on the other, are inevitably drifting apart. If this trend goes on, some day, translators or interpreters might be needed: to translate Swahili into Swahili. (7) What do the following Swahili words mean? Note: These terms are often used in the East African English press without being translated.